The NAACP Legal Defense and Educational Fund (LDF), founded in 1940, is the nation’s preeminent civil rights law firm. While primarily focused on the civil rights of African Americans, LDF has been instrumental in promoting equality for Asian-Americans, Latinos, and women in the U.S. LDF has also been involved in campaigning for human rights throughout the world, including in South Africa, Canada, and Brazil, among others. NEO was engaged to help the organization create a new online presence since their current website no longer reflected the depth and breadth of their work. Comprehensive due diligence revealed the need for better promotion of the firm’s cases and issues and stronger engagement and brand appeal to the organization’s key audiences: donors/funders, policy makers and influencers who work on civil rights issues, academics and researchers, and the press and media. A mood board (or the visual palette) gives the client a birds eye view of all the graphic and contextual elements utilized to create the new website. The new site pushes breaking news and important cases to the fore—two LDF tenets that are essential in today’s constant news cycle and politically-charged climate. LDF’s current and landmark cases over the past seven-plus decades are easily searchable through a custom feature that allows users to search by impact area. 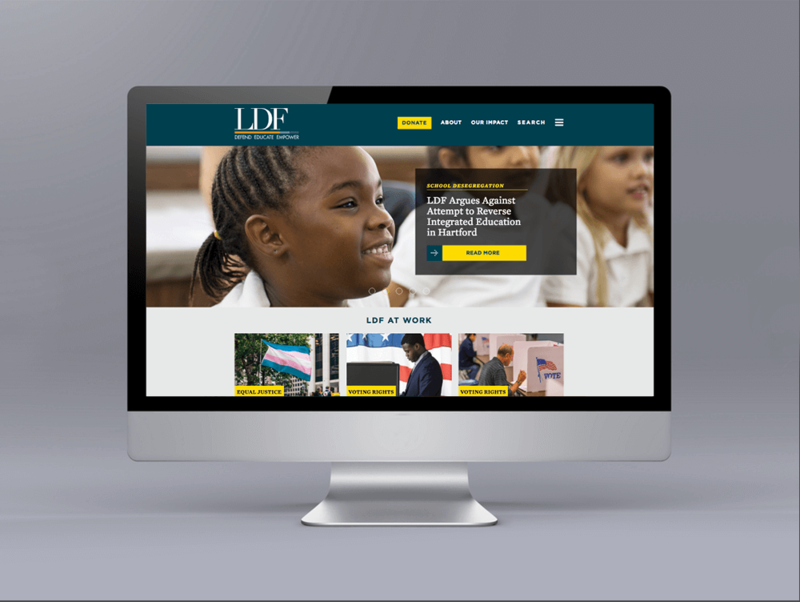 A dynamic online experience that can be accessed on a multitude of mobile platforms heightens user engagement and helps establish LDF as a trusted resource for reliable data, informed analysis and pragmatic approaches to race and civil rights. Visual cues throughout the website drive visitors easily to LDF’s support/donation pages. Of equal importance is creating site-wide accessibility tools (ADA compliant) which ensures access for disabled users as well.